I love aubergines (eggplants), but sometimes get stuck in a bit of a rut, thinking ‘I’ve got an aubergine, I’ll make ratatouille’. Now, much as I love ratatouille, there are so many more delicious things to do with this fantastic vegetable, that I really should try and experiment a bit more! This Stuffed Aubergine makes a great centrepiece for a main meal, served with salad potatoes and green beans, or polenta and a green salad. Also, as it’s low in fat, it makes for a great healthy dish! Bake the aubergine whole in the oven at 175C / 350F /gas 3 for about 40 minutes until soft. Leave the oven on. Slice the aubergine in half lengthways, and scoop out the flesh, leaving enough behind to make a ‘shell’, then chop the flesh. In the oil fry the onion and garlic until soft. Add the aubergine flesh, tomatoes and pine nuts. Cook for another couple of minutes. Then stir in the tomato puree, oats, basil, salt and pepper. 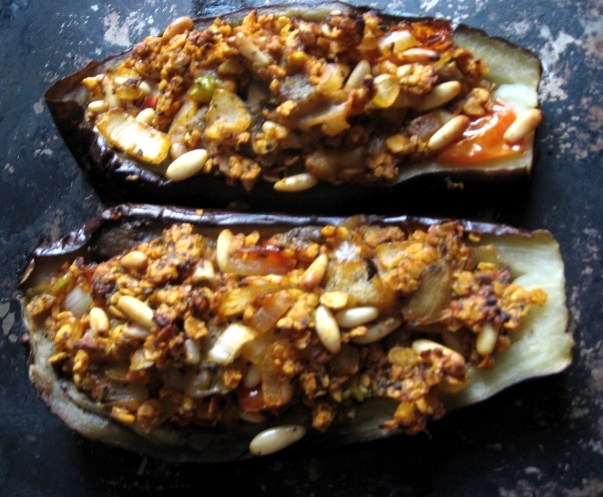 Pile the mixture into the aubergine shells and pack down gently with the back of a spoon. Put on a baking sheet and put in the oven. Cook for a further 15 – 20 minutes or until the top of the stuffing is lightly browned. 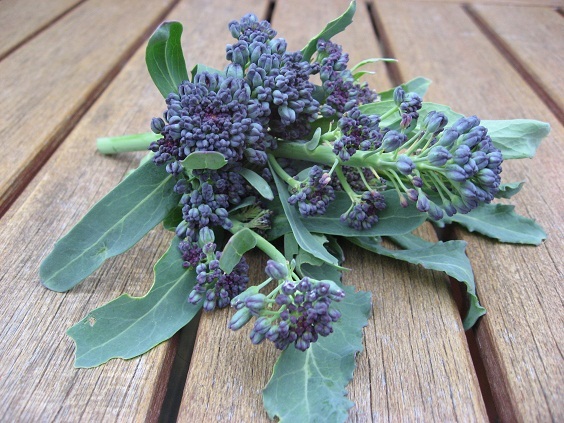 We’ve been picking small handfuls of purple sprouting broccoli for a few weeks now. Most of the plants have been badly eaten by snails, but a few have survived and one plant in particular seems to resist all comers and keep on sprouting. What a trooper! Occasionally we miss the sprouts and they throw out long stalks of lovely white flowers. I guess we’re winners either way. So how best to enjoy this harvest? I favour serving them as a side vegetable just lightly steamed with plenty of crunch left in. And a couple of days ago we had a gorgeous, warm evening, so I decided to make a salad plate with boiled new potatoes, the broccoli and a couple of other dishes. 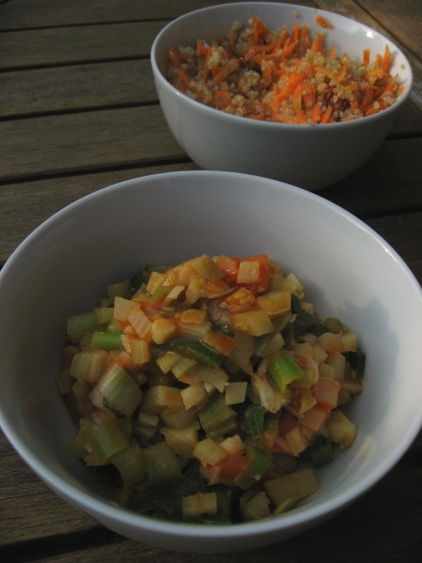 The first was a quinoa salad with grated carrot, pecan nuts and fresh herbs, while the second was this wonderful fennel salsa from Denis Cotter’s lovely book ‘Wild Garlic, Gooseberries and Me’. The best thing about this recipe is that the flavour of the fennel really comes through, as I often find that the delicate aniseed taste of fennel is often lost in other dishes. The salsa is crunchy and summery with fantastic layers of flavour. I loved it! Quarter the fennel bulb and cut out the core, then remove the stalk and any tough or wrinkled parts. Chop the rest into small dice. Heat the olive oil in a shallow pan, add the fennel and cook over a low heat for 1 minute. Add the tomatoes, garlic and spring onions, and cook for 1 minute more. Off the heat, add the lemon zest and juice and a little salt and leave to stand for a few minutes. Use the salsa warm or at room temperature. 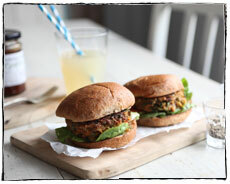 If you follow the wonderful blog in search of the Ultimate Veggie Burger , then you’ll know that finding a successful veggie burger can take a lot of trial and error. Well this recipe from Abel and Cole definitely looks worth a try, and includes a vegan alternative to the egg for binding. Sizzle onion in the olive oil till soft. Add the ground coriander and 1 tsp curry powder. Mix. Cook for a mo. In a food processor, pulse the spiced onions, chickpeas/beans and nuts/seeds till well mixed (not puréed). Tip into a bowl. Mix in the carrots, fresh coriander, lime juice, grated zest and whisked egg or coconut milk to bind. Taste. Add more salt, pepper and curry powder as needed. Shape into patties – squeeze them firmly together. Dust your hands and burgers with flour so the patties aren’t too sticky. Sizzle burgers in a frying pan in a little oil (they’re softer than meat burgers so careful if grilling). Cook till gold on both sides. Delicious in a toasted bap with a dollop of yogurt or chutney, leaves and fresh tomato slices.